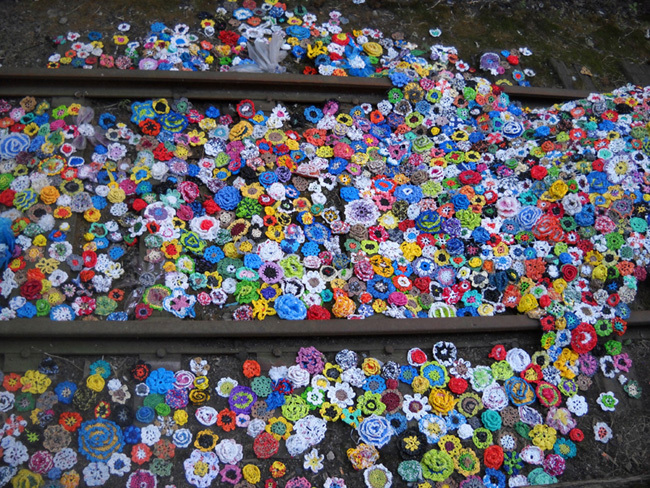 Over 5000 crocheted flowers made from recycled plastic shopping bags. The Brooklyn Army Terminal was originally constructed for the war effort in 1919. It was most heavily used for WWII, and was eventually decommissioned and sold to the city of New York in the 1970's. It now houses a variety of businesses, from a chocolate factory to a balloon manufacturer to artists' studios. The building has an amazing architecture: at the time it was built, it was the world's largest concrete building. The sad truth, however, is that most innovations come from the war effort. Post War Blues addressed what happens to the fruit of war innovations after a conflict is over and how we can work together to start healing a space. My goal was not only to have the current tenants of the Brooklyn Army Terminal work together for a peaceful end, but to also involve the surrounding neighborhoods of Sunset Park and Bay Ridge. 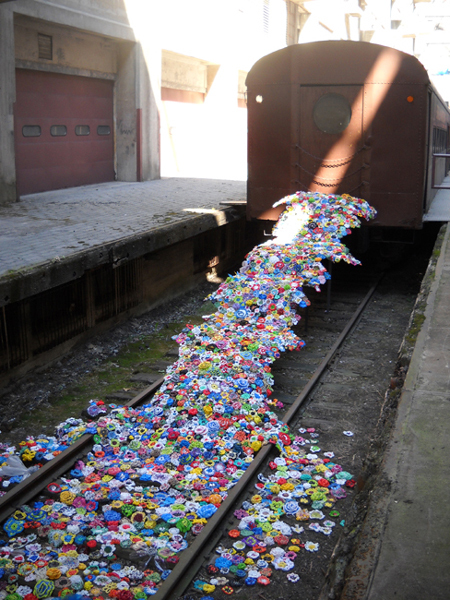 Post War Blues was a site-specific collaborative installation: flowers crocheted and knitted from recycled plastic yarn, burst out of the train car that sits in the Brooklyn Army Terminal atrium. The flowers rise and slowly fall in undulating waves, blanketing the tracks. My goal was for Post War Blues to function as a meaningful public art engagement: to serve as the glue that can bind a community together, and to show that despite our differences and our violent past, we can make something beautiful and meaningful together.